The Network screen is the place you come to for everything that involves your console’s ability to connect to Xbox Live, play multiplayer games, and troubleshoot general network performance issues. The Network screen is divided into three columns. This page describes network settings options that are available from each of these columns. This column features options for setting up a new connection or modifying the existing connection for your home networking devices. You can select from three buttons in column one. 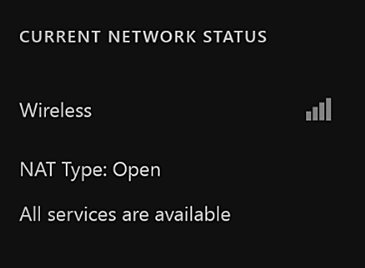 If your Xbox One isn't currently connected to the Internet, or if you want to change wireless access points, select Set up wireless network. Selecting this button deletes any current wireless settings and prompts you to set up a new wireless device. Xbox One doesn't save old device information, allowing you to completely wipe out old settings and start new each time. This saves you from accidental manual entries that could cause issues on a new network. Scenario: You've set up your console's network connection at your house, but you're going to visit a relative and want to take your Xbox One. When you get to your new location, select Set up wireless network, select the appropriate router from the list of devices, enter the password, and connect to the network. When you return home and plug in your Xbox One, you won't automatically connect to your network, because establishing the new connection wiped out your home router's information. Select Set up wireless network, select your router from the device list, and enter your password. Now the previous router information has been deleted and Xbox One will remember your home device's settings. The Advanced settings screen is generally used only by technical users or support. If you've set up your home network to use Static IP addresses, or you want to manually configure your DNS settings, or you need to set up MAC spoofing (changing the Media Access Control address of the network interface on your networked device), select Advanced settings to manually configure your network. The Go offline option is for the offline gamer.. If you are connected to the wired network, only have to disconnect the LAN cable from the back of the console to go offline. However, if you use a wireless connection, the only way to disconnect is to go to the Network screen and select Go offline. This column displays the current status of your network connection. The first indicator tells you whether you're connected. If you are connected, this tells you if you're connected via a wired or wireless connection. If you are wireless, it will display a signal-strength indicator to show the approximate strength of your signal. The second indicator displays your Network Address Translation (NAT) type. Your NAT allows you two different IP addresses, one for internal traffic and one for external traffic. The NAT helps hide your internal IP address and creates a kind of firewall. The third indicator tells you whether all of the Xbox Live services are up and running. If any services are down, this indicator will also detail which ones are down. With an OPEN NAT type, you're able to play and host multiplayer games with people who have any NAT type on their network. With a MODERATE NAT type, you're able to play multiplayer games with some people; however, you might not be able to play with others, and normally you won't be chosen as the host of a match. With a STRICT NAT type, you're only able to play multiplayer games with people who have an OPEN NAT type. You can't be chosen as the host of a match. 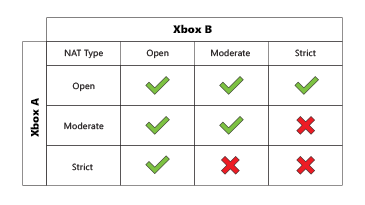 If you can't hear your friends online, or if you can't join or host a multiplayer game, this is because your NAT type is set to moderate or strict. If you want to change your NAT type, it can be difficult, but you can modify it by following the steps in the Xbox One Multiplayer Game Solution. Service status indicates if any part of the Xbox Live service is down. It also helps you determine if you have to troubleshoot an issue on your network, or if it is our services on Xbox that are the issue. 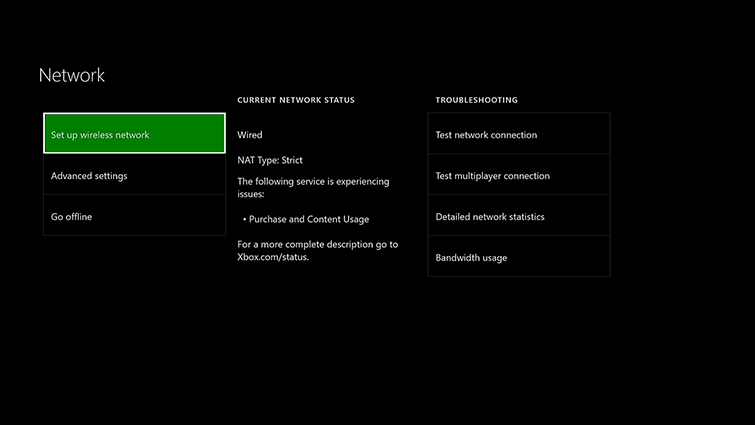 If you see that any service is down, visit the Xbox Service Status page for details on the outage. Column three offers options for troubleshooting your network performance. This column of buttons is specifically used to troubleshoot any issues related to your network connection. If you can't connect to Xbox Live, you can begin troubleshooting by using this test. The Test network connection test verifies that you're connected to your networking devices and that you can reach the Internet. 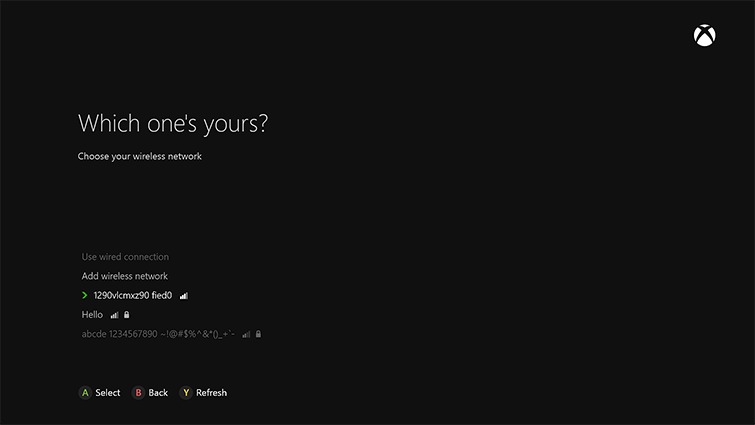 If you see any error message after you run this test, see the Xbox One Network Connection Error Solution for troubleshooting help. If you see the message “It's all good, your console is now connected to the Internet,” check the Xbox Live Service Status to see if there's an issue with the service. If you experience lag, random disconnects, or other game-related network issues, this test helps you identify the issue and works to resolve it. 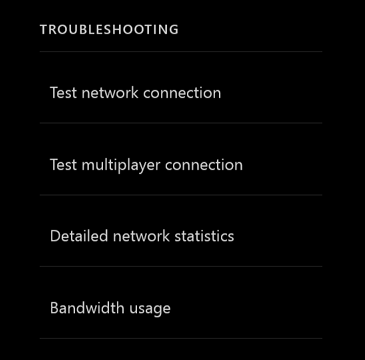 Test multiplayer connection tests anything that might affect your experience while multiplayer gaming on Xbox Live, including IP address, download and upload speeds, packet loss, latency, and MTU (see the Detailed network statistics section below for definitions). If you see any error message after you run this test, see the Xbox One Multiplayer Connection Error Solution. If you experience slow performance when playing Xbox One games on Xbox Live, see the Xbox One Slow Performance Solution. If your Xbox One is getting randomly disconnected from Xbox Live, see the Xbox One Disconnect Solution. Download speed, which is critical for streaming content and playing multiplayer games on Xbox Live. Upload speed, which only affects your ability to play multiplayer games on Xbox Live. Note Upload and download speeds are the result of a speed test and will show you how fast your network can download or upload a file from the Internet to your Xbox One. Download packet loss, which is critical for streaming content and playing multiplayer games on Xbox Live. 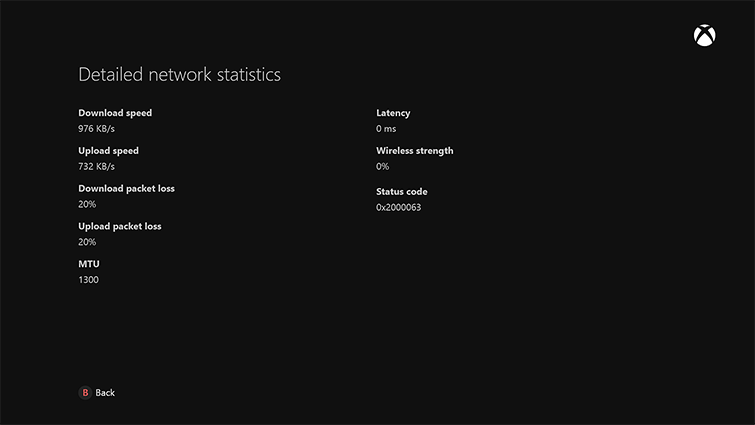 If you see more than 5% packet loss, try troubleshooting your console using the Xbox One Network Connection Error Solution. Upload packet loss, which only affects your ability to play multiplayer games on Xbox Live. Note When content is transferred on the Internet, it's wrapped in packets. This tests your ability to receive the proper number of packets sent. The causes of packet loss include inadequate signal strength at the destination, natural or human-made interference, excessive system noise, hardware failure, software corruption, or overburdened network nodes. Often, more than one of these factors is involved. MTU, which needs to meet a minimum of 1384 MTU or higher to play games on Xbox Live. Checking and adjusting your router settings could quickly resolve many gaming issues if this setting is too low. Latency, which is a networking term for delay of packet delivery. It's measured by how many milliseconds it takes for a packet of data to get from one designated point to another. This can affect streaming, but only by an app timing out. However, latency can drastically affect multiplayer gaming, because you'll be delayed on what you see versus what's happening on the server. In other words, if you have high latency, your game character could be killed before you ever see your opponent on the screen. Wireless strength, which measures the strength of your Internet signal. The closer your signal is to 100 percent, the better your Xbox One connection results will be. Wireless interference that causes low-signal strength is the leading reason for latency and packet loss. This test is designed to test a point in time, so if you remove causes of wireless interference between your router and your Xbox One, you should retest to see what kind of improvement your adjustment made. This test can help you narrow down what's causing wireless interference and how much it's affecting your Xbox One experience. Status code, which displays any error codes that resulted from the test. Status codes are mostly used by Xbox Support. On this screen, the left column shows the current bandwidth usage for the console. In the Time period section, it also shows the bandwidth for a set date range. You can change the end date for this date range by selecting Reset period on this day. The middle column shows the estimated bandwidth usage for the past 12 hours, and the right column shows the estimated bandwidth for recent months. Would you like to contact Support regarding the "Network settings on Xbox One" issue you were reading about or a different issue?